The garlic and one tablespoon of the butter go into the dough, and the rest of the butter is brushed over the rolls both before and after baking. 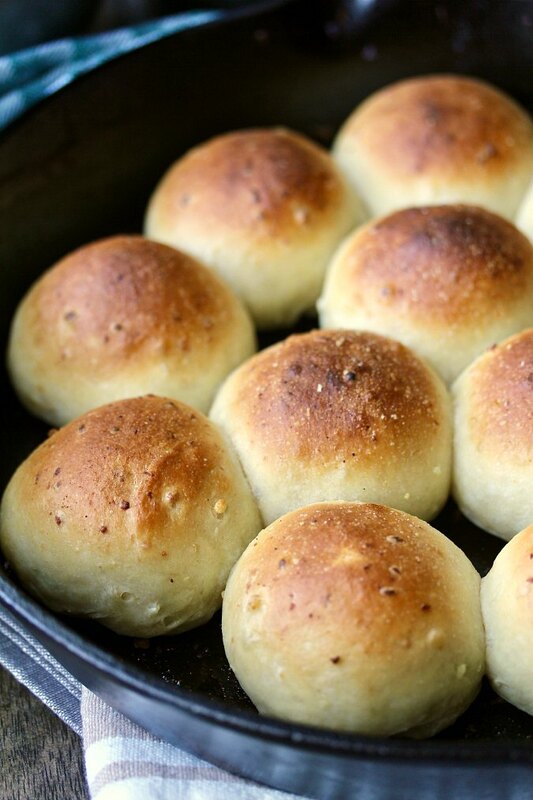 If you love garlic, these rolls are for you. When you make these rolls, your entire house will smell like garlic, which, to me, is a good thing. Rest assured, no vampires will be knocking at your door. 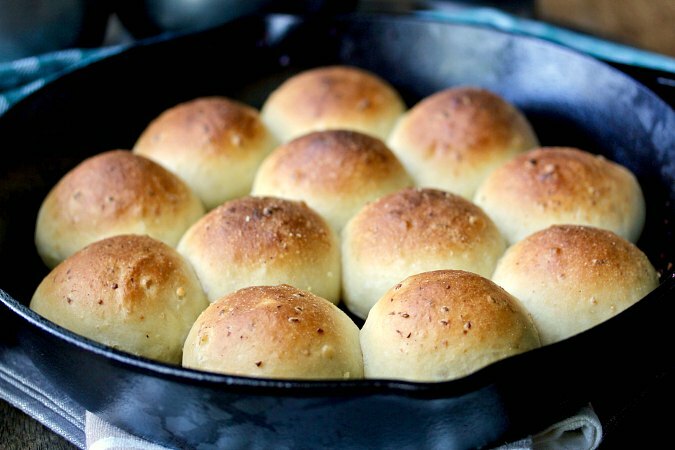 These rolls are soft and light, and the best part is you can serve them just five minutes after they've emerged from the oven. After five long minutes of waiting, I split one in half, spread it with butter, took a taste, and fell in love with these rolls. It was really difficult to resist eating the entire pan of rolls. Even though cast iron pans have been around forever, I am fairly new to using them myself. I think it is because I let my first cast iron skillet (which I received as a wedding gift nearly 100 years ago) completely rust. I had no idea how to fix it, so I tossed it in the trash. Now I know how indestructible cast iron pans are and that I could have brought that pan back to life. I'm happy to have rediscovered the amazingness of cast iron pans. They are perfect for searing food quickly over high heat and they are excellent at retaining heat. I first rediscovered cast iron pans when I got into baking artisan bread. Cast iron Dutch ovens are the best for creating an environment similar to steam ovens, which help develop amazing crusty loaves. In addition, serendipitously, a few years ago I bought, seasoned, and have been keeping a carbon steel wok alive for stir frying, and realized that there is little difference in the maintenance needs of either pan. In fact, the naturally nonstick nature of a wok is very similar to cast iron. I finally gave in and bought this 12 inch cast iron skillet, figuring that if I can keep my Dutch oven and my wok alive, I could figure out how to maintain a cast iron skillet. If you'd like to learn more about maintaining cast iron pans, be sure to check out The Culinary Fanatic. He has the most amazing collection of cast iron skillets. His Instagram feed is worth following too. The more you use your cast iron pan, the better it gets. It gradually develops a natural nonstick surface. It's also virtually indestructible, and you can restore it if, for some reason, it rusts or is mistreated. This month the Baking Bloggers, hosted by Sue of Palatable Pastime, are baking in cast iron. Check out the rest of the cast iron skillet recipes! In a 12 inch cast iron skillet over medium heat, cook the garlic in 1 tablespoon of the butter and 1 teaspoon of water until golden, about 2 minutes. Stir in the rest of the butter and remove the pan from the heat. Let stand for 10 minutes. Using a fine mesh strainer, strain the butter into a bowl, pressing down on the garlic to extract as much liquid as possible. Reserve the garlic and the butter (do not clean the pan). Whisk the water, yeast, 1 tablespoon of the melted garlic butter, and all of the sautéed garlic in a bowl or liquid measuring cup until the yeast dissolves. Add the flour and salt to the bowl of a stand mixer and whisk to combine. Using the dough hook on low speed, slowly pour the liquid mixture into the dry ingredients. Mix on low for about two minutes, and then increase the speed to medium and mix for about eight minutes, until the dough is smooth and springy. The final dough should be tacky but not overly sticky. Form the dough into a ball and place it in an oiled bowl or dough rising bucket, cover, and let rise until doubled, about an hour. Gently deflate the risen dough and form it into a 12 inch log log. Cut the dough into 12 equal pieces and form each piece into a ball (be sure to keep the dough pieces covered with oiled plastic wrap or a damp towel while you are shaping the balls). Place the balls into the skillet evenly placed apart and cover with oiled plastic wrap. Let rise until puffy, about an hour. In the meantime, heat the oven (with a rack in the middle position) to 500 degrees F. When the rolls are ready to bake, brush them with half of the reserved garlic butter. Bake the rolls for about 12 minutes, until golden. If necessary, rotate the pan halfway through baking. Transfer the skillet to a cooling rack and brush the tops with the rest of the reserved garlic butter. Let cool for 5 minutes before serving. Great minds Karen...it amazes me how often we are on the same page. 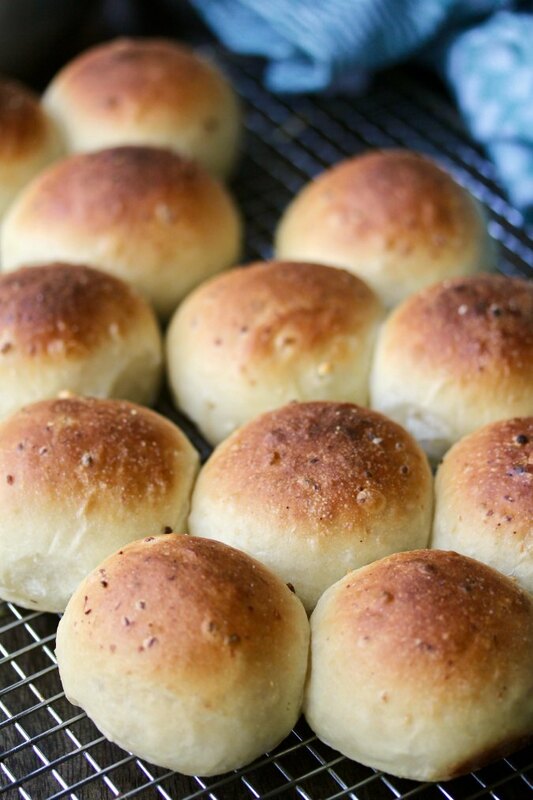 these are some gorgeous looking rolls! Ha ha! I guess I'm not the only one who was intimidated. This looks and sounds wonderful- with all that garlic, I bet smells amazing! I will have to check out that blog- it is great to find info. on cooking with cast iron that is from someone who uses it a lot! Crusty delicious garlic rolls Karen! 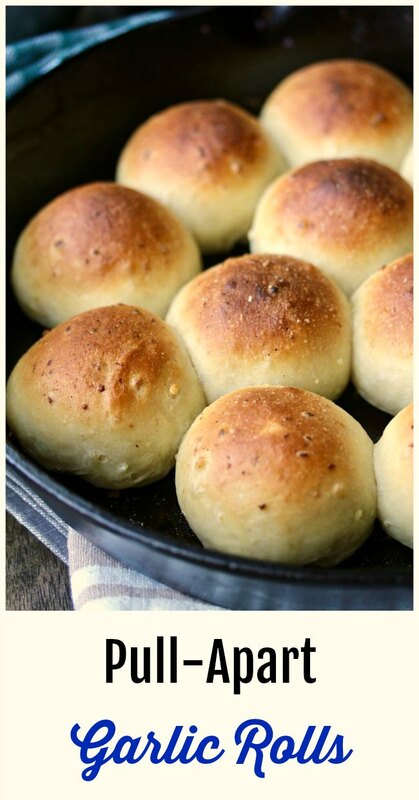 I have a weakness for dinner rolls and the garlic in these? I'm all over this recipe, it's a definite must try for me! You totally need to try these! OMG, those look so good. I do love my garlic. Thanks so much for linking this to First Monday Favorites. I need to wipe the drool from my chin now. TMI? These are yet another recipe of yours I need to try. And those cast iron pans, totally forgiving of neglect. I have a small one that my husband's grandmother gave me, one she'd used for many years. I also have a cast iron Aebleskiver pan which she also gave me. I treasure both of them. Thanks Sid. yes, they can be handed down for generations. For some reason, I never really make rolls but these look wonderful! 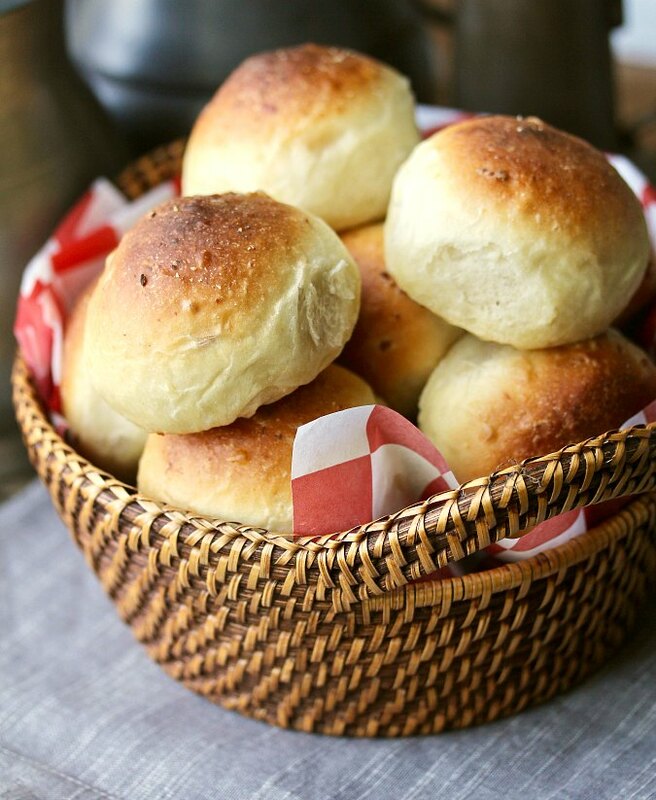 These rolls look so good, I love the garlic in them! I'm planning to make these for Christmas dinner! Oooh! They will be a huge hit!